More then anything else, Fiji is an exotic destination. There are over 300 islands to explore, where you can you swim with huge manta rays congregating by the shore, snorkel over giant rainbow gardens of soft coral, or scuba dive the White Wall and famous Astrolabe Reef. Fiji's popularity with divers is based on the ease of access and sheer beauty of its dive sites. The Northern region is justifiably regarded as the most spectacular area for soft coral diving. The best spot to catch the colour is in the strong currents of the Somosomo straits between Vanua Levu and Taveuni. The Western Region is the closest to Nadi International Airport with watersports being a main feature at all of the resorts. For those wanting to learn to dive this area is ideal with safe diving and operations heavily geared towards dive training. The Central Region begins on the coral coast with its huge resorts and wall diving. All diving is on the outer barrier reef wall which means early morning dives are the norm, as the onshore trade winds tend to pick up in the afternoon. 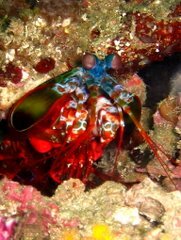 Our personal favorites here at Dive Inspirations? Matangi in the North, and Kadavu in the south.